After decoding formal dress codes on the blog, readers wrote in with a pressing sartorial question: what about cocktail attire? Not all weddings take place at the Ritz, and we’ve certainly enjoyed a boozy mixed drink in less than a floor-length gown. Cocktail attire is a seemingly ever-present term nowadays, showing up on bachelorette party invitations, dinner party invitations, and wedding invitations alike. 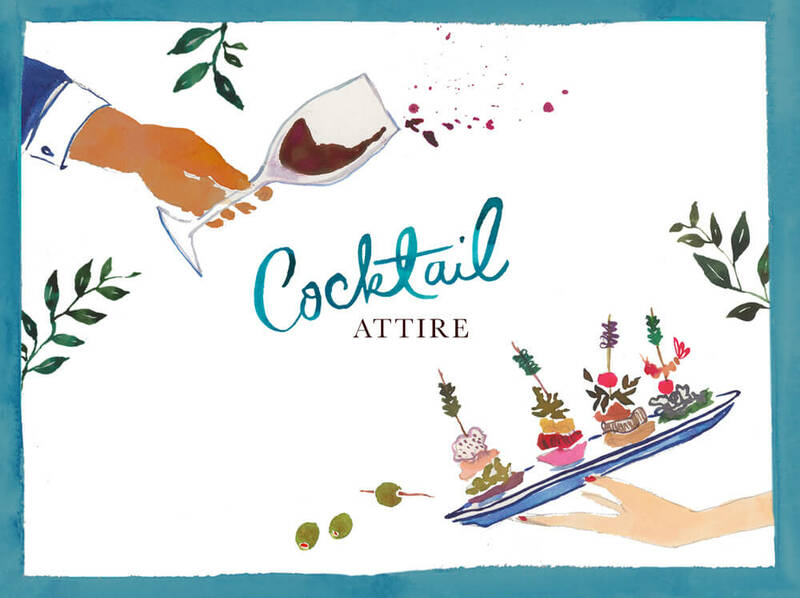 So what is cocktail attire, exactly? As a rule, cocktail attire is about maintaining a dressy spirit without the fussiness of traditionally “proper” etiquette. For women, a cocktail dress (naturally) is the best bet: something stylish and smart, maybe with a little bit of an edge or flirtiness. The celebrated little black dress is the standard, especially when paired with lively accessories to reflect your own personal style. For men, a dark—but not black!—suit with a tie is ideal. Feel free to liven up your outfit with a patterned necktie or pocket square go overboard, or, if you prefer to keep your flourishes on the discreet side, opt for an eccentrically patterned pair of socks (our CEO is partial to sushi socks). When holiday invitations start arriving in your mailbox, you might also encounter a variant of cocktail wear called festive cocktail attire. While this doesn’t give you license to wear a tacky reindeer tie or striped leggings fit for an elf, you can invoke the holiday season in more subtle ways. Consider adding bright reds, greens, and golds, choosing accessories with an extra sparkle, or even swapping in a classy cashmere cardigan or corduroy pants in place of your suit. All are excellent ways of getting into the spirit without turning into a walking tinsel garland.